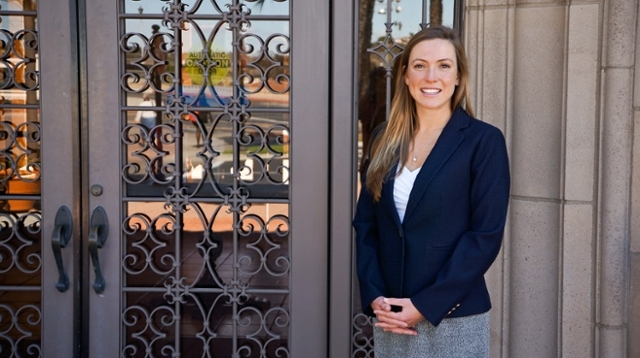 "USD Law has enabled me to pursue a career merging my passion for science with the law. Through my classes and internships, I’ve had the opportunity to learn from professors, judges, classmates, and other professionals in the environmental and energy realm." A: I became interested in law after taking an Environmental Law course at UCSB taught by the Chief Counsel for the Environmental Defense Center in Santa Barbara. While working as a litigation assistant in a small firm after undergrad, I was surrounded by outstanding mentors who encouraged me to pursue a law degree. A: I went into college with the ultimate goal of becoming a marine scientist at Scripps Institution of Oceanography in San Diego. When my career plans took a turn, I chose USD Law because it provided the opportunity to study law in San Diego, a center for scientific advances and environmental policy. A: I became interested in energy law while interning at the California Public Utilities Commission (CPUC), Administrative Law Judge Division during the summer after my 1L year. I applied because I was interested in public transportation. When I started interning, I found myself quickly intimidated by the complexity of the energy proceedings and all their acronyms. The following year in law school, I was able to observe many of the CPUC proceedings through my public interest class at USD. Interning for and observing the CPUC made me understand and appreciate the difficult task of striking a balance between multiple competing interests, weighing environmental and other public interest concerns against project need. Learning about offshore wind while writing a paper for my Climate Change Law & Policy course also deepened my interest in energy law. The number of scientists, interest groups, and regulators that must work together during all the different permitting phases fascinates me. A: I recently began clerking at the law firm I worked for in D.C. last summer, Duncan Weinberg Genzer & Pembroke. I am currently working in the firm’s D.C. office, and awaiting on California bar results. I plan to transfer to the firm’s Sacramento office in January 2019. A: Law school enabled me to explore many different practice areas, job sectors, and work environments. I believe law school trained me to be flexible and somewhat comfortable with being uncomfortable (i.e., always ask questions and don’t assume you know anything). Q: What advice would you give to a prospective student interested in energy and environmental law? What things might you have done differently? A: Take advantage of the many internship opportunities available during your time at law school, both in the public and private sectors. Attend related conferences by applying for student scholarships and taking advantage of student discounts (for example, the State Bar’s annual Environmental Law Conference in Yosemite, and conferences through the Energy Bar Association). Join the Journal of Climate & Energy Law (JCEL) and enroll in related course offerings at the law school (also look for cross-listed courses through other graduate programs at USD). In particular, I’d recommend taking Professor Duane’s Climate Change Law & Policy course while researching and writing on your topic for JCEL. If I could do it all again, I would take law classes related to finance, accounting, and economics to help understand energy markets and utility ratemaking. Q: What is the best thing that has happened to you during law school? A: It is difficult to pinpoint the best thing when I look back at all the incredible opportunities law school gave me. One of my favorite experiences was commuting by bike & Bart from the East Bay to San Francisco after intriguing days working for the CPUC. Some other major highlights included externing for a Federal Judge in San Diego, visiting Tokyo for an ocean policy course, and being a part of the Climate & Energy Law Symposium planning process. The flight home from Sacramento after presenting with the Energy Clinic at the end of 3L year was definitely the icing on the cake.